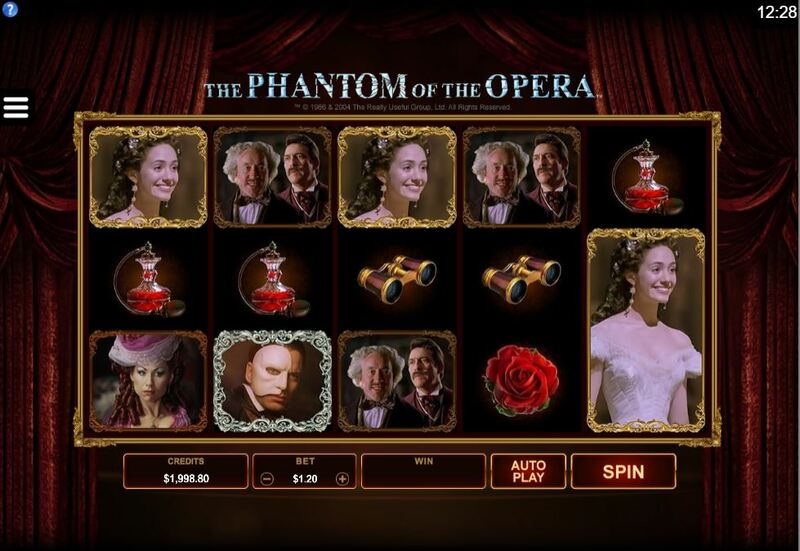 Phantom of The Opera slot was the second of this theme in the race between the two major developers Netent and Microgaming to be released. The Netent version had fixed lines whereas here we see a 243-way format on this trademarked movie-based slot. 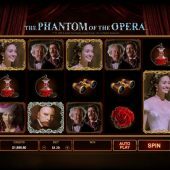 The reels are set over the velvet curtains of a stage and all the opera characters appear in the rather impressive graphics and some gentle classical music from the show plays during the spins which changes score when a win or feature appears. The slot is certainly well presented and quite a soothing game to play, but will it be as gentle with our bankroll? The cost per spin of the 243 ways is 30 coins as is usual with Microgaming, the same that we see on Thunderstruck 2 and more appropriately The Finer Reels Of Life which maybe offers the luxuries visitors to the show would no doubt enjoy. In keeping with recent Microgaming releases such as Tarzan, the reels contain stacks but only up to 2 rows high, including the Wilds with the game logo which also form the top 5-of-a-kind win with 10x bet as your reward. There's no spoiling this genteel theme with crude card values as all icons are nice glossy pictures or photos and The Phantom pays 8x, Lady Singer 7x, Male Actor 6x, Countess 5x, pair of visitors 4x with the minor Rose, Music Sheets, Binoculars, Fakir and Perfume offering 3x down to 1x per 5-reel way. There is a waxed and sealed letter on reel 5 which when appearing offers us a golden display which you may find excessive given that you've just won a cash prize of between 2 and 20x your total bet; much better is the random Chandelier feature which is introduced by a sinister guffaw by the Phantom and the chandelier smashes to turn 1 to 3 random reels Wild, so don't hope for the potential for a full screen of Wilds which is possible in the equivalent Wild Desire event in Immortal Romance for example! One very welcome change to the often stale Microgaming model is that when you finally get 3 or more Phantom Mask scatters in view, you can actually choose the bonus round and thus guarantee yourself the free spins - at last, Microgaming! Music of The Night free spins - 10 free games with one to four random events possible on every spin, which are up to a 4x multiplier on win(s), up to 3 Wild reels, up to 5 randomly-placed Wilds and up to 5 additional free spins. Masquerade Picks - 3 levels of various masks which reveal cash awards and cash awards with +1 level. You pick until collect and some good awards of 100x bet or more can be had if you get to third level picks. All I Ask of You free spins - 10 free spins where the lovers appear floating over the screen during each spin. If they stop on the same position, a 2-5x multiplier is applied to wins on that spin, if adjacent to each other their reels both turn Wild, if diagonally adjacent then a block 2x2 Wild forms and finally if the lovers stop on the same reel it turns Wild. No extra spins or retriggers are possible.